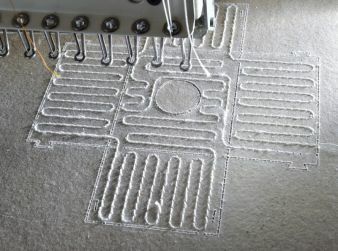 Heating elements produced using stitching and embroidery technology have a number of advantages over the conventional specialised wound heating elements currently used in, for example, automatic injection moulding machines for the plastics industry, machines used in chocolate production and switching cabinets for wind turbines. "With our modern stitching technique," explains Kay Reuter, Project Director at W. Reuter &Sohn Spitzen und Stickereien GmbH, "we can produce innovative high performance materials such as ductile wires and mineral base fabrics faster and with great precision. This provides significantly better heating homogeneity in the material." 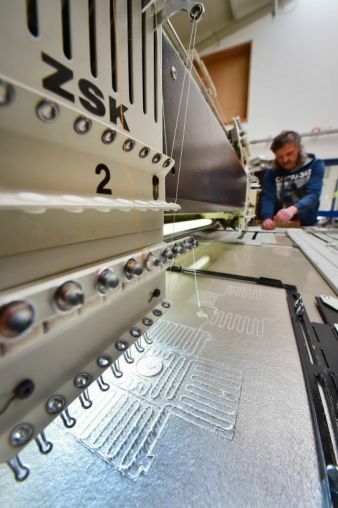 His company, based in Auerbach, Germany, is collaborating in the highstick plus project with the Sächsische Textilforschungsinstitut (STFI, Saxony Textile Research Institute) in Chemnitz and with two companies, SL-Spezialnähmaschinenbau of Limbach-Oberfrohna and KSG-Gerätetechnik of Waldheim. At this year's Techtextil trade fair in Frankfurt, this core growth project, supported by the German Ministry for Education and Research, also presented new types of embroidered lighting systems for advertising and for interior design in buildings. These have been developed in collaboration with a number of companies: Stickperle (based in Falkenstein), KSL Keilmann Sondermaschinenbau (Lorsch), EDC Electronic Design (Chemnitz), Messebau Schmieder (Chemnitz), Textilausrüstung Pfand (Lengenfeld) and with STFI. Products that are being embroidered include LED strips, optical fibre bundles and light ropes.